Not to be confused with Saw (2004 film). Saw (retrospectively also referred to as Saw 0.5) is an Australian short subject horror film, released in 2003. It was directed by James Wan and written by Wan and Leigh Whannell, the latter also starring in it. It was originally used to pitch their script for a full-length feature film of the same name to various studios and actors. The full-length film was eventually made in 2004. The short film later became a scene in Saw, with Shawnee Smith as Amanda Young wearing the Reverse Bear Trap device instead of David. The original short can be viewed on the second disc of Saw: Uncut Edition. The song "Happiness in Slavery (remix)" by Nine Inch Nails is featured in the first scene and end credits of the film. Inside the room, David was strapped to a chair with a large, rusty metal device locked onto his head. To his left was a small television, which began playing a video showing a frightening puppet that tells him that the device on his head is a "reverse beartrap", which is hooked into his jaws and will pry his face open with great force if he does not unlock it in time. The puppet tells David that the only key to unlock the device is in the stomach of his dead cellmate (Dean Francis). David is able to break free of his bonds, but by doing so he sets off a timer on the back of the device. Across the room, he finds the body that the puppet mentioned, but also finds that the man is actually alive but under paralysis. David panics and stabs his cellmate before starting to look for the key. He slices into the man's stomach and after finding the key, David unlocks the device and throws it to the ground, just as it snaps open. David begins screaming and weeping in horror. At the entrance to the room, the puppet from the video appears on a tricycle. He congratulates David on surviving, and tells him that he has proven he is no longer ungrateful for being alive. The film ends with the police officer asking "Are you grateful, David?" causing the young man to again break down. As the end credits begin to roll, a CGI replica of the bathroom used later in the full Saw film is shown, although with some differences. A small peephole is shown with an eye visible behind it, which was a concept reused in another trap in Saw. Prior to 2003, colleagues James Wan and Leigh Whannell had begun writing a script based for a horror film, citing inspiration from their dreams and fears. Upon completing the script, Leigh and James had wanted to select an excerpt from their script, later to be known as Saw, and film it to pitch their film to studios. With the help of Charlie Clouser, who had composed the score for the film, and a few stand-in actors, Leigh and James shot the film with relatively no budget. Leigh had decided to star in the film as well. During filming, it was said that the trap used on Whannell was revealed to be fully functional and very rusted, making it very dangerous. The version of the trap used in the full film was made safer and had artificial rust. Wan later revealed that the film was shot in just over eight days. Upon completing the film, the pair traveled to Lions Gate studios to screen the film. Lions Gate immediately accepted the deal and got approved for a US$1.2 million budget to make their script into a full feature film. Instead of being paid in advance, Wan and Whannell agreed to take a percentage of the profits from the film's release, which turned out to be much more than initially expected. 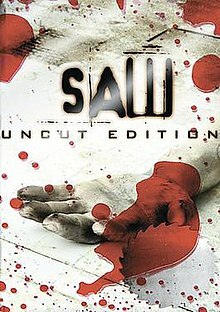 This allowed for the creation of Saw, a film that was intended to be a direct-to-DVD release that was later released into theaters worldwide after it received a positive reaction at the Sundance Film Festival in January 2004. The film retained the scene from the short, which was reshot with different actors. Leigh Whannell would also return to star in the full-length film, and in Saw III. After the release of the full-length Saw, the film was met with overwhelming success in the box office both domestically and internationally. The film ended up grossing US$55 million in America, and US$48 million in other countries, totaling over US$103 million worldwide. This was over US$100 million profit, over 80 times the production budget. This green-lit the sequel Saw II, and later the rest of the Saw franchise based on the yearly success of the previous installment. Since its inception, Saw has become the highest grossing horror franchise of all time worldwide in unadjusted dollars. In the United States only, Saw is the second highest grossing horror franchise, behind only the Friday the 13th films by a margin of US$10 million. ^ IGN FilmForce; Elwes, Cary (27 October 2004). "Interview: James Wan and Leigh Whannell". IGN Entertainment. IGN Entertainment. Retrieved 8 November 2016. ^ "Saw". Box Office Mojo. IMDb. Retrieved 8 November 2016. ^ Borden, Lizzie (23 October 2009). "Top Five Highest-Grossing Horror Franchises". HorrorFatale.com. Retrieved 8 November 2016.